Though less intimidating than more populated states, Iowa nevertheless has more than 60 colleges and universities, having some of the most competitive programs in the nation. Choosing the right school can be challenging. Prospective students must choose between two and four-year colleges, taking into account location and reputation. These are not the only factors to consider. Acceptance, retention, graduation and enrollment rates are also vital to choosing the right school. Fortunately, we have applied our rigorous methodology to the latest education data to rank the best colleges in Iowa, including the top four-year and two-year schools. Our rankings also include student loan default percentages, our way of recognizing the importance of being able to pay off your debt after graduation. The list below details the top two-year and four-year colleges in Iowa. Iowa has many highly-competitive four-year programs in both public and private schools. The state is facing an aging and more diverse population, forcing the state's schools to adapt to the changing environment. Despite having many very good schools and nationally ranked programs, Iowa has one of the highest rates of student loan debt after graduation in the nation. The Board of Regents has recently initiated a program to give more funding to resident Iowa students in an attempt to mitigate the large quantity of non-resident students in public universities. This makes financial aid and scholarships more accessible to native Iowans. Nevertheless, Iowa receives a relatively large influx of uneducated students who come to Iowa to study, attracted to the nationally ranked universities, low cost of living, and opportunities within the state. Whether in-state or out, Iowa is a great place to get a four-year degree. We've compiled a list of the state's very best colleges to help you decide. Located halfway between Iowa City and Des Moines, Grinnell is one of the most prestigious liberal arts colleges in Iowa, with a history dating back more than 150 years. Early in its existence, Grinnell was the center of the Social Gospel movement, which sought a Christian ethical approach to social problems such as poverty and racial inequality. Today, the college still maintains a focus on social activism and responsibility, annually awarding the Grinnell Prize to individuals who demonstrate a commitment to social justice. Academically, Grinnell offers 26 majors and 12 concentrations for undergraduate students, ranging from art history and economics to global development studies and neuroscience. The school also maintains the Expanding Knowledge Initiative, a unique program that encourages interdisciplinary learning outside of students' chosen majors, offering varied opportunities for integrative studies, advanced projects, and mentorship from faculty members. A flagship university in the city of Ames, ISU is home to more than 36,000 students, making it one of the largest colleges in the state. Established in 1859, ISU is an internationally recognized institution, drawing students from all 50 states and over 100 countries. With eight academic colleges, ISU offers 100 bachelor's degree programs, including unique majors such as aerospace engineering, animal ecology, horticulture, and veterinary medicine. Throughout its history, the school has been on the cutting edge of academic and technology development; the first electronic computer was invented here, and it's now home to one of the most advanced virtual reality labs in the world. Widely recognized as one of the best colleges in Iowa, ISU's alumni include major figures in U.S. history, including inventor and botanist George Washington Carver, Vice President Henry A. Wallace, and women's suffrage advocate Carrie Chapman Catt. A unique healthcare college in Sioux City, St. Luke's traces its history back to the late 19th century, though the school did not assume its current name until 1966. St. Luke's is one of the smaller Iowa colleges in the region, but the school has trained thousands of health professionals throughout its existence. Students can earn bachelor's degrees in either health science or nursing and gain hands-on experience in a clinical environment. St. Luke's is housed on the campus of UnityPoint Health, a comprehensive healthcare facility, which gives students access to sophisticated health simulation laboratories as well as the professional facilities of UnityPoint. The health science program offers advanced leadership and management experience to credentialed healthcare providers, while the nursing program prepares registered nurses for higher level care positions. Both programs are available through either campus courses or a fully online format. Established in 1847, UI is the oldest college in the state, and the school's enrollment of 33,000 also makes it one of the largest colleges in Iowa. The school sits on a 1,700-acre campus in Iowa City, offering more than 200 areas of study through 11 academic colleges. In addition to popular majors in arts, sciences, and business, IU's bachelor's programs include unique degrees such as actuarial science, environmental policy and planning, geoscience, and nuclear medicine technology. UI is a major center of arts and culture in the region, and the school's art museum boasts one of the country's top university collections, with more than 14,500 pieces. Alumni from UI are leaders in art, politics, and entertainment, and some of the school's more famous graduates include writer Flannery O'Connor, news anchor Tom Brokaw, artist Elizabeth Catlett, and Iowa Governor Terry Branstad. Recognized as one of the best and most affordable Iowa colleges, UNI serves more than 11,000 students from its campus in Cedar Falls. The college offers more than 90 undergraduate majors, including unique degree programs in gerontology, movement and exercise science, criminology, and graphic technologies. UNI offers ample study abroad opportunities for students, and the college has ranked among the top five in the country for total number of students who pursue international study. The school's varied academic programs have produced notable alumni in a range of fields, including artist and filmmaker Abinadi Meza, NFL MVP and Super Bowl winner Kurt Warner, and U.S. Senator Chuck Grassley. The school's 900-acre campus is marked by several local landmarks, including student-run radio station KULT, the University of North Iowa Gallery of Art, and the 16,000-seat UNI-Dome, home to the school's Panther's football team. Founded in 1955, Dordt is a private liberal arts college affiliated with the Christian Reformed Church, though the school accepts Christian students of all denominations. The college occupies a 115-acre rural campus in Sioux Center and serves a student body of around 1,400. More than 60% of Dordt's students hail from outside Iowa, and the school's international population represents more than 20 countries. In addition to unique religious programs like Christianity and popular culture, church music, and worship arts, Dordt offers secular undergraduate programs such as astronomy, community development, construction management, and digital media. Dordt has one of the strongest alumni networks among all Iowa colleges, maintaining regional chapters for graduates all over the country. Alumni can easily locate a nearby chapter or work with the school to start their own. Drake's 150-acre campus in the state's capitol is home to more than 5,000 students, and the school enjoys a reputation as one of the best colleges in Iowa. Founded in 1881, Drake now offers more than 70 undergraduate degree programs, including kinesiology, magazine media, public relations, and sculpture. For students interested in law, Drake offers four accelerated programs that allow students to complete undergraduate requirements faster and earn a law degree with one less year of study. Drake's campus is also home to more than 160 clubs and student organizations, including several respected media groups. Students can participate in KDRA, the campus radio station; KGVC, the television station; and numerous magazines published through the School of Journalism and Mass Communication. Founded in 1861 as a Lutheran seminary, Luther is now an exclusively undergraduate institution and a member of the Evangelical Lutheran Church in America. The college stresses practical preparation; around 70% of students complete applied learning experiences during their time at Luther, such as internships, practicums, or student teaching, and more than 23% report securing employment before graduating. Students at Luther can choose from a range of bachelor's programs, from data science and environmental studies to health education and museum studies. Luther is also known as one of the top music colleges in Iowa, and several of its campus groups -- including the Jazz Orchestra, Symphony Orchestra, Concert Band, and Nordic Choir -- have toured and performed internationally. Almost half of the school's students participate in at least one campus music group, and many Luther graduates go on to respected music careers. One of the most selective colleges in Iowa, Coe is located in Cedar Rapids, and the school's nearly 70-acre campus is home to 1,400 students. Coe's small size offers a close-knit campus community and a more intimate academic setting, with an average class size of just 16 students. 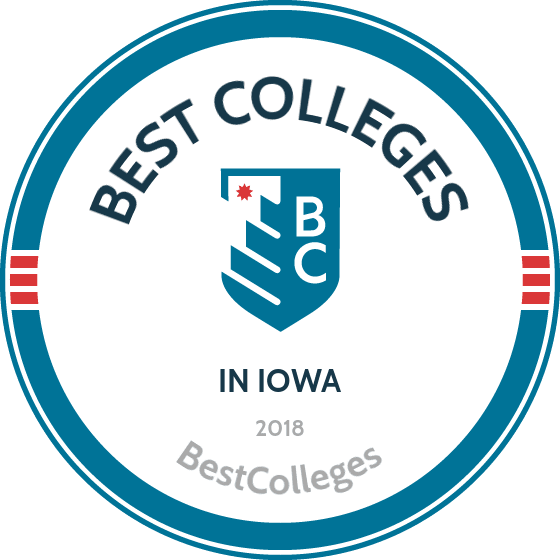 As one of Iowa's top schools, Coe is a member of Associated Colleges of the Midwest, a prestigious group of liberal arts colleges that rank among the oldest and best in the region. Students at Coe can choose from more than 60 areas of study, ranging from Asian studies and creative writing to molecular biology and neuroscience. Coe's curriculum is grounded in the liberal arts, and all students receive a well-rounded, interdisciplinary education that encompasses subjects outside of their chosen majors. The college also boasts one of the largest and most respected writing tutoring centers in the country. Located along the Mississippi River in the town of Dubuque, Loras is a private Catholic school that's one of three Iowa colleges in the Archdiocese of Dubuque. Home to around 1,600 students, the college is committed to the Catholic intellectual tradition and the professional, social, and religious growth of students and faculty. Accordingly, Loras embraces an educational philosophy of community-based, experiential learning, combining classroom time with internships, service opportunities, and study abroad programs. The school's curriculum emphasizes social commitment, and students have the opportunity to perform work that actively aids diverse community populations. Loras offers a large selection of degree programs in professional studies and the liberal arts, including media studies, politics, international studies, and creative writing. Campus life at the college also offers a range of involvement opportunities, including academic organizations, faith organizations, student advocacy, and intramural sports. Established in 1882 as a Christian academy, NWC evolved into a junior college and finally a four-year liberal arts school in 1961. The college is affiliated with the Reform Church in America, a Reformed Protestant denomination, and students receive a Christian-centered education that also stresses rigorous academics. A small college of around 1,200 students, NWC boasts an intimate campus setting with a low student to faculty ratio. The school offers a range of degree programs in secular and non-secular subjects, including youth ministry, music and worship leadership, ecological science, and sports management. Students from underrepresented populations can also enroll in the school's Bridge Scholars program, which offers academic scholarships and co-curricular activities that develop leadership skills and cultural intelligence. As one of the top liberal arts colleges in Iowa, NWC has been home to notable scholars and faculty throughout its history, including playwright Jeff Barker and Civil Rights activist A.J. Muste. A Catholic liberal arts college located in Cedar Rapids, Mount Mercy is affiliated with the Sisters of Mercy, a religious institute dedicated to concerns of environmental sustainability, immigration, nonviolence, racial equality, and women's rights. Serving a coeducational student body of nearly 1,900, the college enrolls students from all around the world, boasting a student to faculty ratio of just 13:1. Students at Mount Mercy can major in religious studies, but the school also offers a range of uncommon degree programs, including actuarial science, music education, outdoor conservation, and science marketing. In addition to specialized courses in liberal arts, students at Mount Mercy take interdisciplinary core courses that focus on the college's core values, exploring issues of social justice and community values. The school also places a strong emphasis on service learning, and students are encouraged to pursue educational and work opportunities that benefit the local community. Founded in 1853, Cornell is one of the most progressive colleges in Iowa, and the school was the first in the state to award degrees to women. Cornell is one of the only colleges in the country to offer courses in a block plan, which has students take classes one at a time in comprehensive "blocks" that last about three and half weeks. The block format allows for a more in-depth experience in each course, as students can participate in immersive learning activities without scheduling conflicts from other classes. With full-time enrollment, students take eight block courses each year. Cornell still offers traditional liberal arts majors, along with degree programs such as engineering sciences, kinesiology, and management. The college's unique education model has led to notable alumni in a range of fields, including historian Don E. Fehrenbacher, NASA astronaut David C. Hilmers, and former U.S. congressman Chris Carney. Wartburg is affiliated with the Evangelical Lutheran Church in America, though the school accepts students of all creeds and has eight world religions represented in the student body. Located in northeastern Iowa in the town of Waverly, the school also maintains Wartburg West, a secondary campus in Denver, Colorado, and students can take advantage of unique study opportunities offered between both campuses. Wartburg has a long tradition of educational innovation; its social work program was the first of its kind in the state, and its music therapy degree is the only program of its kind among private colleges in Iowa. Students can choose from dozens of other bachelor's programs, including art education, international relations, and peace and justice studies. Wartburg also offers ample study abroad semester options in countries around the world, including Chile, Germany, China, and Australia. Operated by the Society of the Divine Word, a missionary congregation of the Latin Church, Divine Word is the only undergraduate Catholic seminary in the country dedicated to missionary training. The college serves students from all over the world, offering three bachelor's degree programs: intercultural studies, philosophy, and theology and religious studies. Regardless of major, Divine Word's core curriculum is rooted in the liberal arts and prepares students to become engaged global citizens and lifelong learners. Courses in humanities, communications, and theological literacy train students to be effective leaders and missionaries, reinforcing the school's core values of spiritual growth, service, integrity, and opportunity. The school offers a range of scholarships, and a focus on admitting students from immigrant and refugee communities makes Divine Word unique among religious colleges in Iowa. A private Christian liberal arts college associated with the Reformed Church in America, Central was founded in 1853 in the town of Pella, about 40 minutes southeast of Des Moines. Home to about 1,200 students, the school ranks as one of the top Christian colleges in Iowa, known for its commitment to environmental stewardship and comprehensive international programs. Central offers a range of study abroad opportunities in different formats and for different lengths of time, available in countries all over the world, including China, France, and Ghana. On campus, students can choose from 73 academic programs, including actuarial science, exercise science, and German studies. Central's alumni include former Good Morning America anchor Steve Bell, Miami Dolphins defensive end and Super Bowl champion Vern Den Herder, and former U.S. ambassador Bernadette Allen. A private, Christian liberal arts college, Graceland was established by the Community of Christ, a church rooted in the Latter Day Saint movement, though the school itself is non-sectarian and accepts students from all denominations. Founded in 1895, Graceland's main campus sits on 170 acres in Lamoni, about an hour south of Des Moines. The school ranks as one of the top colleges in Iowa, offering dozens of degree programs in arts, sciences, and professional studies, including health and movement science, social media marketing, sports management, and web design. Graceland boasts a particularly strong arts community, with more than a third of students participating in some form of visual or performing arts. The school's campus is also home to the Shaw Center, a regional arts center that boasts a 625-seat auditorium, a recital hall, and a black box theater. A private liberal arts school founded in 1882 and affiliated with the Roman Catholic Diocese of Davenport, St. Ambrose is one of the top colleges in Iowa. Serving around 3,600 students, the school boasts an average class size of 20, offering individualized student attention from dedicated faculty with a student-teacher ratio of just 11:1. St. Ambrose's extensive academic offerings include 60 bachelor's, 13 master's, and three doctoral programs. Along with unique bachelor's degrees, including book arts, behavioral neuropsychology, human performance and fitness, and mechanical engineering, the school offers several accelerated programs, including applied management studies, business administration, accounting, and nursing. St. Ambrose provides students with a variety of resources to ensure success both during school and after graduation, including academic advising, veteran's services, career resources, counseling, the accessibility resource center, and the student success center, which offers tutoring, study groups, and supplemental academic resources. Situated on a picturesque campus on the shores of the 3,200-acre Storm Lake, BVU is a private college associated with the Presbyterian Church. Serving around 900 full-time students, BVU is one of the smaller colleges in Iowa, offering an enviable student to faculty ratio of just 9:1 and an average class size between 10 and 19 students. At BVU, students can choose from a varied selection of academic programs including majors in education, business, exercise science, digital media, and biomedical sciences. The college emphasizes experiential education, and around a third of students participate in internships and other active service learning opportunities each year. BVU is also a major proponent of community service, with students, faculty, and staff volunteering around 37,000 annual service hours for local organizations. Most students remain in Iowa after graduation, and 98% find work or enroll in further education within six months of graduating. Based in Sioux City, Morningside is a Methodist-affiliated liberal arts college with a full-time student body of around 1,300. The school's origins date back to 1894, and much of Morningside's campus is nationally recognized as a historic district. Undergraduate students can choose from more than 20 bachelor's degree programs, including majors like agricultural and food studies, arts administration, and mass communication. Morningside is focused on the integration of education and technology, and all students receive a new laptop at the start of their freshman year. The college's technology refresh cycle allows students to trade for another new laptop at the beginning of their junior year, which they keep after graduation. Morningside's innovative education practices have produced several notable alumni, including sociologist Samuel A. Stouffer and sisters Pauline Phillips and Eppie Lederer, best known for their newspaper advice columns "Dear Abby" and "Ask Ann Landers." Clarke, known as the region's arts college, offers a range of undergraduate degrees from accounting and art history to musical theater and social work. The school began its life in 1843 as an academy for women before transforming into a liberal arts college in 1901. Clarke is the only college in the country associated the Sisters of Charity of the Blessed Virgin Mary, a Roman Catholic institution with deep roots in Iowa. Today the school serves more than 1,000 students from 27 U.S. states and six countries. As one of the top colleges in Iowa, Clarke has attracted several notable faculty members over the years, including Game of Thrones author George R.R. Martin, who taught English and journalism, and computer science pioneer Mary Kenneth Keller, who founded the school's computer science department. Affiliated with the United Methodist Church, Simpson is a small liberal arts college in the town of Indianola, about 18 miles south of Des Moines. Established in 1860, the school now serves around 1,400 full-time students. Simpson offers a range of bachelor's degree programs, including forensic science, global management, multimedia journalism, and sports management. Simpson is known among Iowa colleges for its focus on civic engagement, exemplified by the school's John C. Culver Public Policy Center, which encourages students to pursue public service careers. Simpson also has an active campus community, and around 84% of students are involved in some form of extracurricular activity, such as student government, music and arts organizations, and the campus newspaper or radio station. Greek life is also a large part of the Simpson experience, and the school is home to three national fraternities, three national sororities, and one local fraternity. Briar Cliff, a Catholic, Franciscan college, was founded in 1930 as an all women’s school in Sioux City. The school became coeducational in 1965. Briar focuses on providing a liberal arts education and offers undergraduate, graduate, and minors programs. Bachelor’s programs include business administration, criminology and criminal justice, computer science, and graphic design. Online and evening degree completion options are available. The university’s honors students receive smaller class sizes, one-on-one research with faculty members, and are offered early registration. Many of Briar’s study abroad programs offer class credit; places of study include Italy, Chile, and Guatemala. There are many ways to get involved on campus, through campus ministry, and clubs and organizations. Ministry includes daily Mass, student-led retreats, and local-outreach. Student clubs include Chamber Choir, Education Club, and Science Club. Students can participate in the school’s athletics programs, in baseball, softball, basketball, and more. Focused on both liberal arts and professional studies, William Penn University serves around 1,500 students from its campus in Oskaloosa, as well as in Johnston. The school was founded in 1873 by Quaker settlers. While Penn's core curriculum is rooted in Quaker beliefs and heritage, students of all backgrounds make up its enrollment. Undergraduate programs at Penn are divided into seven divisions: Applied Technology, Business Administration, Education, Health & Life Sciences, Humanities, Nursing, and Social and Behavioral Sciences. William Penn also offers Online and Evening Classes as well as a Graduate Studies program. Penn is also a strong athletic contender among Iowa colleges. Including eight National Tournament appearances for Men's Basketball, numerous National Tournament appearances for Women's Golf, a recent addition of Men's and Women's Lacrosse and Men's Volleyball, as well as producing several alumni in professional sports. Grand View, a private, nonprofit, liberal arts institution, was founded in 1896. The school is affiliated with the Evangelical Lutheran Church. The student body is about 2,000, and represents 30 states and 17 countries; about 800 students live on-campus. Grand view has a student-to-faculty ratio of 14:1. Undergraduate, graduate, and minors programs are offered. Bachelor’s degrees include graphic journalism, music education, psychology, and business administration. Students can earn credit for studying abroad in Denmark, Italy, and other countries. Two honors programs are offered: LOGOS and ALT. LOGOS, which is invitation-only, has students take courses focused on self-awareness, nature and human nature, and religion. There are four courses; learners will take one per quarter starting freshman year. ALT is an honors magazine for students with talents in communication, writing, art, and design. Athletics include baseball, basketball, cross country, and tennis. Over 32,000 students in Iowa choose to study in a two-year program. Many of these students go on to study at a four-year university, saving money or getting necessary prerequisites. Other students get a two-year degree to take advantage of opportunities in the workplace. Currently, less than 36% of Iowa's working-age residents hold a two-year degree or higher, but it is projected that 62% of all jobs will require some form of higher education by the year 2018. The majority of Iowans with an associate degree stay in Iowa, as opposed to those who get a four-year degree. Whether you need a higher salary or plan to transfer to a four-year university, the best two-year schools in the state are highlighted below. North Iowa, the oldest public, two-year college in Iowa, is located in Mason City and was founded in 1918. The school enrolls about 3,700 students each year. NIACC has over 100 associate degree and certificate programs in technical/trade and academic, transfer-seeking fields. NIACC’s offerings are divided into 16 career “clusters,” including health services, architecture/construction, law, and STEM fields. NIACC has transfer agreements with over 40 four-year colleges, making it one of the best community colleges in Iowa. The school offers its students a chance to make informed decisions through a career coach program that provides data on the current employment market. NIACC participates in the community through the Pappajohn Entrepreneurial Center, which seeks to provide local business owners with the tools to start or grow new businesses in Iowa. NIACC’s football team has produced three NFL players, including current Baltimore Ravens’ offensive lineman Marshal Yanda. Enrolling approximately 1,628 students on a 269 acre campus in Sheldon, Northwest Iowa is one of the smaller two-year colleges in Iowa. NCC is one of the fastest growing schools in the nation, having nearly doubled in enrollment since the turn of the century. NCC maintains a 13:1 student-to-faculty ratio. NCC’s course offerings are divided into two categories--arts and science/transfer credit programs and career/trade programs. NCC offers eight different “pre-professional” arts and science programs. Northwest has transfer agreements with Iowa State, the University of Iowa, Briar Cliff University, Buena Vista University, the University of Northern Iowa, Dordt College, and Northwestern College. NCC helps graduates find jobs. In the last five years, 98% of NCC graduates have found jobs; 100% of graduates from skilled trade programs found jobs. The NCC Placement Office provides students with support services, posting jobs on its website and offering NCC students lifetime placement assistance. Northeast Iowa has campuses in Calmar and Peosta, and an auxiliary campus in Dubuque. Originally founded as a technical institute, NICC now offers more than 85 academic programs, including GEDs, short-term adult education and certification courses, online and blended learning (six programs in finance and business), and individualized business/industry development. NICC is among Iowa community colleges to offer an affordable education: credit hours cost $179 for in-state tuition and $184 for out-of-state tuition. NICC’s students range from high schoolers earning college credit (2,740 students) to community members taking advantage of Business and Community Solutions courses (22,336 students). The college enrolls just under 7,000 students in associate’s degree and technical certification-seeking courses. 95% of NICC’s 2014 graduates found a job or were continuing their education within six months, and students averaged a 24% return on investment in the ten-years immediately following graduation. Iowa Lakes, created in the 1960s by the Iowa Department of Education, serves a rural area that encompasses five different counties. ILCC serves 3,900 full and part-time students. ILCC’s course catalog contains over 100 academic programs. The school offers academic and trade-related courses. Students pursuing transfer credit can complete bachelor’s degrees through Buena Vista University and Briar Cliff University without leaving the Iowa Lakes campus. AA degrees can also be transferred to four-year Iowa Regent Universities--Iowa State, the University of Iowa, and the University of Northern Iowa. Among vocational/technical offerings, ILCC’s state-of-the-art wind energy and turbine technology program stands out. Graduates pursue careers in the renewable energy sector. Other programs include auto collision and repair, early childhood education, and computer programming. Online programs are taught through ed2go, and include accounting specialist, business administration and management, and business specialist. Iowa Lakes is one of the best community colleges in Iowa. Marshalltown Community College, affiliated with Iowa Valley Community College District, enrolls more than 2,000 students and maintains a student-to-faculty ratio of 13:1. MCC students can choose from more than 50 degree program options in eight a href="https://mcc.iavalley.edu/academics/academic-programs/" target="_blank">categories: business and computers, health occupations, humanities, math and sciences, public and professional, skilled trades, social sciences, and transferring/undecided. The majority of MCC students (84%) earn a transferable associate degree. MCC also operates a satellite campus in Grinnell, known as Iowa Valley Grinnell. MCC and Iowa Valley Grinnell offer AA programs entirely online. Marshalltown Community College also offers on-campus housing. The college has three residential buildings that host about 156 students in suite-style spaces. MCC athletic programs include baseball, softball, men’s and women’s basketball, volleyball, and men’s soccer. Students can participate in many clubs, activities, and organizations, and the College organizes a host of student-focused events throughout the academic year. Formerly the Hawkeye Institute of Technology, HCC has existed since 1992. As one of the best community colleges in Iowa, the school offers transfer credit programs in the liberal arts and sciences, technical education, business development, community education, and study abroad programs. Study abroad locations include Brazil, Mexico, and Russia. College credit courses are offered to high school students. Located in Waterloo, Hawkeye currently enrolls about 5,400 students. Hawkeye offers academic programs in agriculture, arts, business, education, health, industrial and engineering technology, information technology, liberal arts, power technology, and safety services. Hawkeye’s liberal arts degree fulfills the general education and elective requirements for a bachelor’s degree at Iowa Regent Universities--Iowa State, the University of Iowa, and the University of Northern Iowa--and several private colleges throughout the midwest. The liberal arts program can be completed through day or evening classes, on-campus, online, or hybrid. Classes in the program last for eight, 12, or 16 weeks. Eastern Iowa serves six counties and is part of a consortium of three colleges: Clinton Community College, Scott Community College, and Muscatine Community College. This includes 17 academic centers over a 120 mile stretch of the Mississippi River on the eastern state border. The three colleges generally enroll over 8,000 students. 10 schools are AAS transfer partners with the school. Iowa State, Iowa Wesleyan, Western Illinois, and others, all have articulation agreements with the school. EICC’s degree programs are split into two categories: associate degree/transfer credit programs and career technology credit programs. The school offers over 50 career credit programs. EICC has transfer credit programs in finance, business, and health science. The district has short-term, community oriented, non-credit classes in business and adult education, which enroll over 30,000 students each year. Customized programs are offered for local businesses. Athletic programs include men’s and women’s cross country and soccer. Southeastern’s three locations: Fort Madison, Keokuk, and Burlington serve 2,578 transfer credit and technical certificate-seeking students. SCC offers degree programs in arts, sciences, and mathematics. Certificate and associate of applied science fields include business, information technology, construction, automotive technology, and health sciences. At SCC, arts and sciences programs are the most popular, enrolling 79.4% of students. Over 200 courses are offered online. SCC is a part of the Academic Quality Improvement Program; the school receives quality checkups every year from representatives. SCC also offers Career Coach services, providing data about current employment trends. SCC athletics are one of the more extensive programs among Iowa community colleges. The Southeastern Blackhawks compete in baseball, basketball, softball, volleyball, golf, cheerleading, and sport shooting. Clubs and organizations include African American Heritage, Computer Club, Drama Club, and Psych Club. Student housing will be available fall 2017. With a main campus in Sioux City and four satellite campuses in Mapleton, Le Mars, Denison, and Cherokee, Western Iowa Tech serves nearly 7,000 full and part-time students. WIT divides its courses into two categories: transfer programs and technical programs. The majority of WIT’s programs are technical, offering certificates and associate in applied science degrees in fields like accounting, auto engineering, construction, and dental assistance. The new culinary program, which began in 2015, has students hone their skills in a modern test kitchen. WIT’s Security Institute offers customized associate of applied science degrees in technical studies, preparing its graduates for real-life, real-time crises. The school’s Lewis and Clark Jazz Fest is a popular yearly event among Iowa colleges. The event draws a number of big bands and jazz choirs from regional schools. The engineering program hosts a radio program called Comet Radio. KCC is named after Iowa’s governor during the Civil War, Samuel J. Kirkwood, a former United States senator, and a fervent abolitionist. The school serves Iowa’s Creative Corridor through a central campus in Cedar Rapids, eight regional centers, and a partnership with the University of Iowa. As of 2014, KCC enrolled 23,422 students. About two thirds of the student body are enrolled in arts and sciences/transfer credit courses. Kirkwood offers academic programs in 10 different categories: agriculture, arts, business, energy, health sciences, hospitality and tourism, information technology, liberal arts, public administration, and STEM. Kirkwood’s agricultural sciences offerings comprise the largest program among community colleges in Iowa and the entire nation. The college campus houses a 400-acre working farm, including a 6,000 square foot area that includes a greenhouse and diverse wildlife. Iowa Western enrolls approximately 5,500 students in 84 different academic programs. Like other two-year colleges in Iowa, IWCC offers vocational/technical courses and arts and science/transfer credit courses. The school enrolls approximately 42,795 community members in continuing adult education classes every single year. Iowa Western’s standout program is its flight school. Graduates of the college’s aviation professional pilot program earn a two-year associate degree which is easily transferred towards a four-year degree. Many students finish their aviation bachelor’s at the University of Nebraska’s Omaha Aviation Institute. The radio performance program teaches students how to promote, produce, and report on a radio show. Participating in the school’s radio station, 89.7 the river, is optional. Other programs include accounting technician, business administration, computer science, and dental hygiene. Athletics are available in baseball, soccer, track and field, and wrestling. Indian Hills has three campuses that serve 10 counties throughout southeast Iowa. The community college offers courses in three different categories: arts and sciences, advanced technology, and health sciences. IHCC also offers 250 fully online courses. Students can start courses in August (fall), November (winter), February (spring), and May (summer). IHCC’s advanced technology associate in applied sciences and arts and science transfer credit programs take 18-24 months (6-7 terms) to complete, while health sciences offers programs that last 1-24 months. Technology courses are taught in IHCC’s Advanced Technology Center, a 125,000 square-foot space built in 1990. IHCC stands out from other two-year colleges in Iowa by investing resources into its Rural Health Education Partnership, which facilitates collaboration between local health care and emergency service organizations. IHCC also constructed its Rural Health Education Center in May 2007 as a multiuse space for courses and meetings among local health care organizations. Ellsworth is a member of the Iowa Valley Community College District. The school is one of the older community colleges in Iowa; it was founded in 1890. Ellsworth was originally founded as a private academy and currently enrolls only 835 students. Ellsworth offers 57 degree programs in five fields: agriculture and animal sciences, business and computers, health occupations, liberal arts and social sciences, and mathematics and sciences. Two thirds of Ellsworth’s student body pursue arts and science/transfer credit paths. The associate in arts is popular because it transfers to many four-year degree programs. Ellsworth has articulation agreements with Iowa Regent Universities--Iowa State University, the University of Iowa, the University of Northern Iowa. All credits from Ellsworth’s AA degree are accepted at those schools. Athletics include baseball, football, and men’s and women’s basketball. Iowa Central enrolls 5,697 students with a central campus in Fort Dodge. It serves Webster County and has satellite campuses in Webster City and Storm Lake. The college offers over 45 programs in six different categories: business, health science, industrial technology, liberal arts, science, and transportation technology. Iowa Central offers recreational and personal enrichment classes, economic development and community service activities, and basic adult education for the surrounding Iowa community. Online courses are offered in 15 week and eight-week formats. ICCC is among Iowa community colleges with an athletics department. They boast a successful wrestling program, having produced a number of professional wrestlers and mixed martial arts fighters, including former world number one Jon Jones. Former Iowa senator Daryl Beall also attended Iowa Central. Other sports programs include baseball, softball, and football. Student activities include bonfires, student clubs, and intramural sports. The campus features a 3000 sq. ft. cafe. Serving the capital city of Des Moines and the surrounding central Iowa Area, DMACC has the highest population among two-year college in Iowa. It enrolls 36,861 credit students and 22,556 non-credit students. DMACC offers 153 programs and short-term course certificates, including career and vocational programs, technical certificate courses, and liberal arts transfer credit degrees. All students are required to complete SDV108, an academic goal-setting and skills course. Each credit hour costs approximately $147. DMACC’s most popular programs are English, math, psychology, biology, and history. DMACC has transfer agreements with public Iowa Regent Universities — Iowa State, University of Iowa, University of Northern Iowa--and private colleges--Grinnell, Simpson, Tuskegee, Drake. The college has a study abroad in London program; students are eligible to apply for scholarships and financial. If you're thinking about applying to one of the best colleges in Iowa, continuing reading to learn more about living in the Hawkeye State. In the middle of the "American Heartland," Iowa is a Midwestern state of mostly rolling hills. It has 56,276 square miles and is bordered by three rivers: the Des Moines River to the south, the Mississippi to the east and the Big Sioux to the west. Iowa has a humid continental climate across all its regions. Summer is hot and humid and winters are cold and harsh. Snowfall and tornados are both common in the state. Iowa is in the heart of the Corn Belt, but though agriculture plays an important part, the state has a diverse economy, with manufacturing, finance, biotechnology and insurance. The capital and largest city is Des Moines. The cost of living in Iowa is much lower than many states. Des Moines is 8% below the national average. Iowa City has been named the first U.S. "City of Literature" by UNESCO. Throughout the state, there are art museums, music festivals, the Iowa Speedway and natural sites like Driftless area and the Iowa Great Lakes to enjoy. Below we go into greater detail about each region. A student is considered a resident if they are dependent on a parent who is a resident of Iowa. If the student's parents have moved from Iowa, the student is still considered a resident if they maintains continuous enrollment. A high school student whose parents move from the state their senior year will still be considered a resident if the student has not established domicile in another state. If one of the student's parents lives in Iowa but the student lives with the other parent in a different state, it is possible to claim residency in Iowa, depending on which parent provides the majority of financial support and which claims the student as a dependent on state income taxes.